Adjectives are describing words. (Or to be more technical: They are words placed next to a noun to modify or affect its meaning.) They're what turn a weekend into a sunny weekend, a cake into a decadent chocolate cake. If you like sunny weekends and chocolate cake then there are just a couple of slight tricks to getting these adjectives right in Spanish. In Spanish, however, they usually come after the thing they're talking about. Our old friends, gender and quantity, pop up again to meddle in our affairs. Depending on whether a noun is masculine or feminine, and whether you're talking about one thing or lots of things, your adjectives might also undergo a slight alteration. The general rule is that if your adjective ends in an -o or an -a, it will change to match the gender and quantity of the thing it's talking about. That means adding an -o to describe masculine nouns, or switching to an -a for feminine nouns. And whenever there's a plural, chuck on an -s as well. The pattern above applies to almost all adjectives. If an adjective doesn't end in an -o or -a (probably because it ends in an -e), then it doesn't need to change to match the noun. See what happened there? 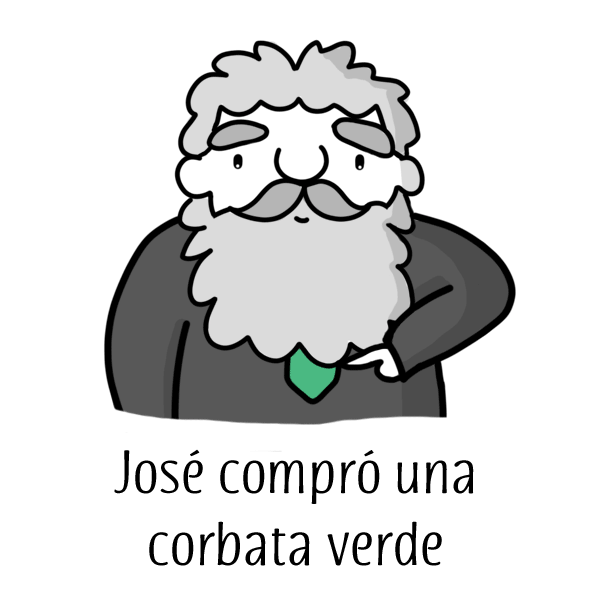 The adjective is verde (green). It ends in an -e, so it doesn't change to match the feminine corbata (tie), nor the masculine abrigo (coat).